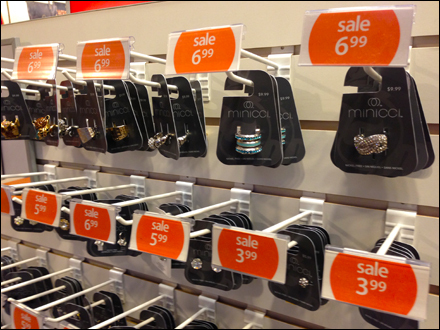 If you want your hooked sale items to better stand out, maybe your hook pricing graphic should reflect the sale status. 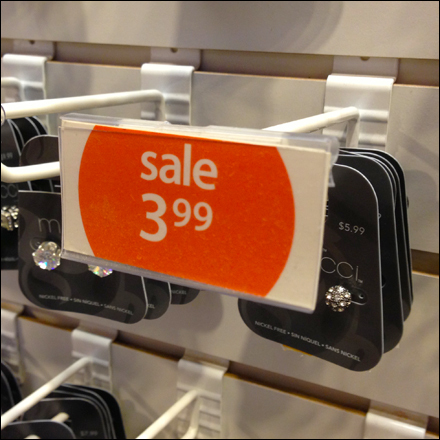 Here priced sale inserts project a common theme, typeface, color and style across an entire display. The curved outline of the color area on the lable, are an additional strategy to faux silhouette and help the promotion stand out. The orange color-codes items as on sale. CLICK the thumbnail for a closeup view. “Micro Labeling Tag” for a scrolling list of discussions. “Micro Labeling Pinterest Board“ visual summary.